The Shoe Rack by We Do Wood is a shoe rack to be mounted on the wall. It was designed by Sebastian Jørgensen and accommodates four pairs of shoes - no matter whether high heels, sneakers or boots. Shoe Rack is an attempt to create a piece of furniture, which allows a simple and yet elegant shoe storage. Solo as well as in the group does the shelf make a good figure and is a great addition to the Coat Frame. 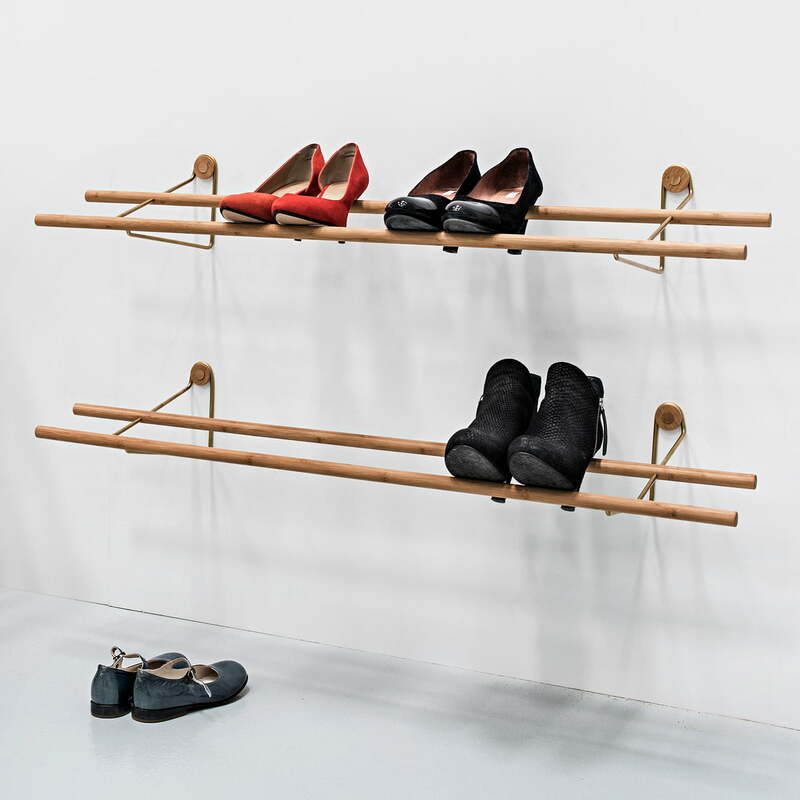 The shoe storage is composed of a metal frame and two bamboo sticks and allows to be mounted on the wall at any height. Bamboo is the most sustainable and thus environmentally friendly raw material in the world. We Do Wood exclusively works with wood plantation, whose bamboo is grown without using chemicals, pesticides, herbicides or fertilisers. On top of that is the production of furniture also without harmful substances and each part of the shoe rack can be easily recycled. Individual image of the Shoe Rack by the manufacturer We Do Wood. 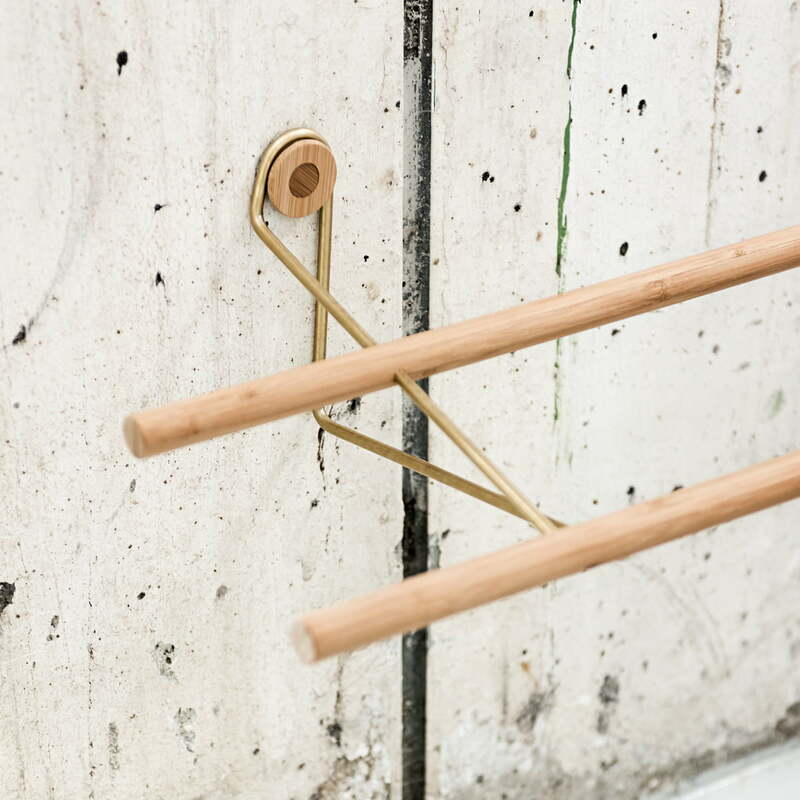 The shoe rack was designed by Sebastian Jørgensen and consists of sustainable bamboo and brass. The shoe storage from the manufacturer We Do Wood is composed of a metal frame and two bamboo sticks and allows to be mounted on the wall at any height. 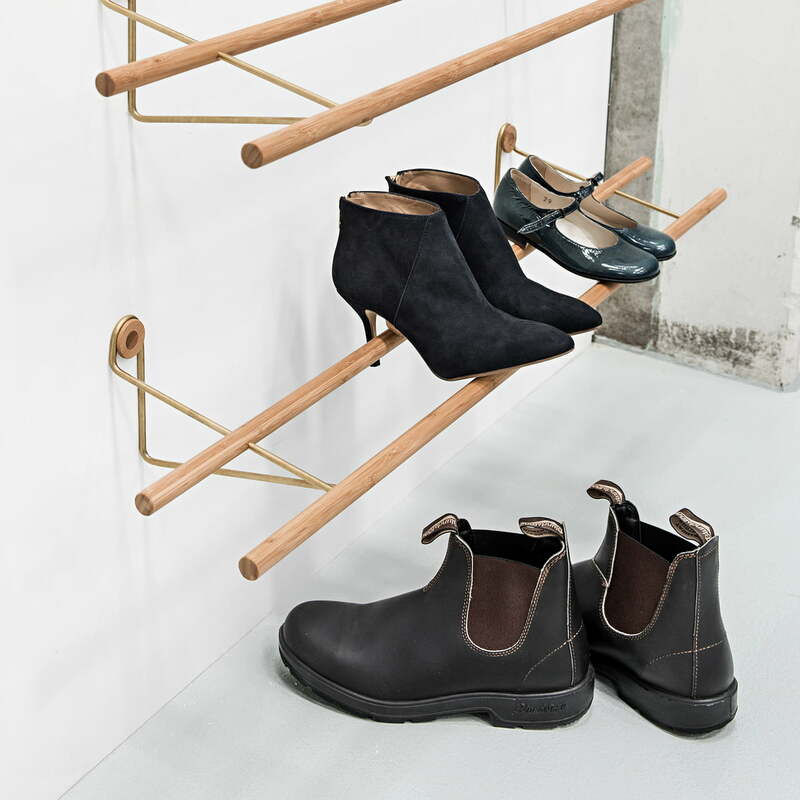 The Shoe Rack designed by Sebastian Jørgensen for We Do Wood is an attempt to create a piece of furniture, which allows a simple and yet elegant shoe storage. 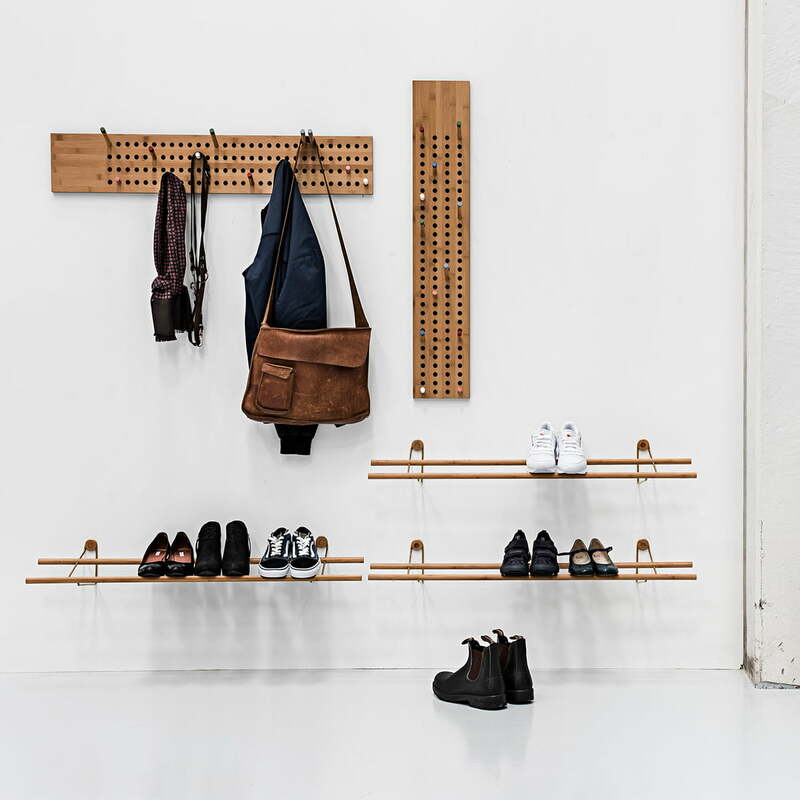 Alone as well as in the group, the Shoe Rack by Sebastian Jørgensen for We Do Wood cuts a fine figure in the entryway and hallway made of bamboo and metal. 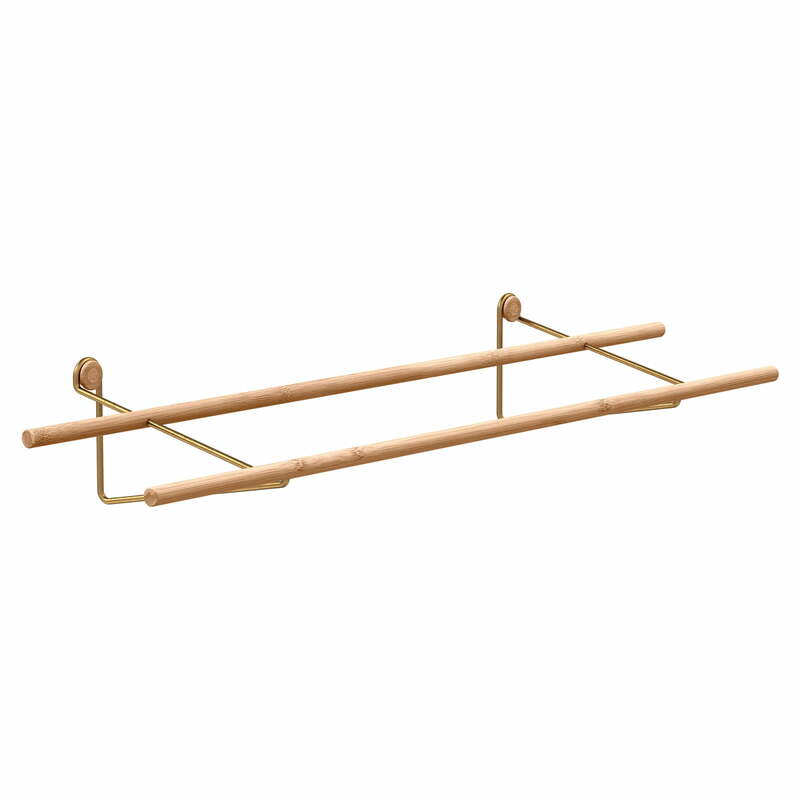 Both the Shoe Rack made of bamboo and brass as well as the Button Stool in rust red made of bamboo and beech were designed by Sebastian Jørgensen for We Do Wood. The Shoe Rack by the label We Do Wood presents all shoes stylishly in the entrance area and on the Button Stool you can take a seat to put your shoes on. The Shoe Rack, the Button Stool and the Coat Frame by the manufacturer We Do Wood together form a timeless and practical cloak room in the entrance area. No unnecessary details disturb the impression of a clear exterior – so typical for the clear-natural Scandinavian style. With the Scoreboard coat rack and the Correlations Bench, designed by Sebastian Jørgensen for We do wood, Scandinavian charm also moves into your home and enchants any entrance hall.